PRO: Signed with the Riders in April, 2018…signed by the New York Jets in October, 2016… signed as an undrafted free agent with the Jacksonville Jaguars in 2015. 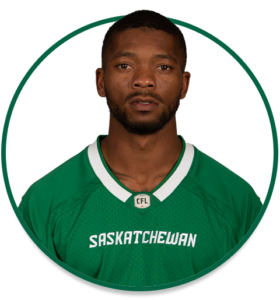 2018: Started 13 games at defensive back…picked up 26 defensive tackles, two tackles for loss and a forced fumble…added three interceptions for 149 return yards and two touchdowns…also had 18 carries for 48 yards and seven touchdowns as the short yardage quarterback…named a CFL Top Performer for Week 10…started the Western Semi-Final…had four defensive tackles and two carries for two yards and a touchdown. COLLEGE: Spent two seasons at Auburn (2013-14) where he played quarterback…completed 320 of 532 pass attempts for 4,508 yards with 34 touchdowns and 13 interceptions and rushed 325 times for 1,866 yards with 23 TDs with the Tigers…led Auburn to the 2014 BCS National Championship Game, which the Tigers lost to Florida State… spent one season at Garden City Community College, where he played quarterback in 2012… began his college career as a cornerback at Georgia in 2011.